I think a topic like this is necessary, so amateurs like me won't spam other topics or slow down the great work experts here are doing. When does melt season normally kick in? - is this the official beginning of melt season 2013? Welcome, wanderer. I'm an expert in (asking) stupid questions. I don't know about an official definition, but for me the melting season starts as soon as total sea ice area/extent has reached a maximum, in other words when the trend lines on these graphs peak. During the first subsequent weeks area and extent decrease is slow, but in May the melting season starts in earnest, switching to high gears in June, July and the first half of August. Mind you, it's good to remember that a large part of the ice pack continues to thicken for several weeks after the area/extent maximum was reached. That's because ice may melt at the edges because of the arrival of the Sun, but the further you go towards the North Pole the longer it takes for the Sun to start shining there every day to cause more melting than the ice can thicken. On more than one occasion, I've seen so-called "Stupid" questions cause the "Briliant" people to identify solutions to critical problems. In almost every "Brainstorming" session that I ever facilitated, it was "Off-the-Wall" or "Out-of-the-Box" ideas and/or comments that led to concrete proposals or solutions. OLN.....Absolutely agree. I have been facilitating problem solving groups for nearly 15 years in manufacturing. We always want several pairs of "fresh eyes" on the teams. These are people that know nothing about the process. I tend to agree with Neven, the new season in terms of area/extent starts from the day of maximum area/extent, typically in March. However the volume decline season starts later in April, because thickening within the Arctic ocean continues even as the peripheral oceans area/extent is falling. It makes sense to consider that the melt season starts from when the net trend starts to be loss. However I would have some sympathy with a combined start date of the Spring equinox, as it is the solar input that drives the seasonal cycle. In the end the question of which is the better approach is answered by considering what you intend to do with the baseline you've set: Be it a moveable date of maximum, or a fixed date related to solar influence. So this is the question I have been mulling over... years ago (I cannot find my source for the life of me) I read about a "lag" in CO2 readings. Like, a lag of about 50 years. So is it true (I hope not) that the effects we are seeing now are the result of carbon released years and years ago? If true, what does this say about the effects yet to be seen from steadily increasing releases since the 1950's? If we are rapidly approaching 400ppm this year, what does that say about upcoming years? I am well aware that CO2 is extremely long-lived and remains in the atmosphere for decades and centuries, if not longer. So I guess I am trying to wrap my head around what and when today's changes (like the current drama in the Arctic ice) might be attributed to - I am pretty sure it was not my trip to the local grocery store yesterday - and I fear grocery stores are going to become relics. Good news is- we still have time to slow that ppm down. Some people believe 450ppm is the point of no return. Bad news is that nobody is listening. Or rather- the people required to listen are too in debt with coal/oil/energy industry to dedicate energy policy around leaving carbon in the ground. In reality there is no "magic" ppm number, it's still way above any normal historical ppm without AGW. Can we stop it before it becomes a runaway situation? I'm not sure "when" the public will awaken but the perception of a problem and the scale of resources needed to bring the ppm down is a challenge. Well, of course we can slow the ppm down, but how far into the future will it have an effect? My personal headcase is trying to figure out what the ppm will be in 50 years, even if we shut everything down tomorrow, due to the "lag" which I am not sure is a real thing or just something I heard somewhere. Thanks for the reply, I totally agree with you, though! it's seems to be a steady climb up. 50 years from now? definitely north of 450. When will we feel it? probably at a quicker rater than what we pumping into the atmosphere somewhere. It's a good question though. To put it another way - during what time frame did our climate change because of "x" amount of carbon put some time ago to create today's conditions? 2005? 2007? If that "450" number is correct, when will we feel those specific effects? We'd feel it a lot quicker than 400. I think we'll hit 450 easily within 10 years and effects will hit 3-5 years after that. I guess I am wondering if we are currently feeling the effects of 350 (or whatever) in lagged time. My stupid question relates to the moon's orbit. As the max declination of the moon from the equator plane is 28,7deg, wouldn't this create a circular wave of tide on an open ocean above 38,7 degrees north? On earth the only example is the Arctic Ocean. (EDIT: well Antarctic cirumpolar currents might also apply) With the tides rushing to shores, and moving a bit forward with the moon as it recedes, wouldn't this create a tidally driven coastal current on such an ocean? I bet this has been discussed somewhere in the blog already, but not bothering to seek the info now. is this an east- or westward current? Does it have much to say in the cracking spring ice? There could be some use for a 'basics'-thread for those entering this forum area? sort of RTFM of physics related to ice and arctic. for me, it's been somewhat tedious f.e. to find out many of the locations mentioned in the posts, so a reference map would be nice. ...it's been somewhat tedious f.e. to find out many of the locations mentioned in the posts, so a reference map would be nice. The Atlantic water comes in and as it evaporates/freezes the remainder becomes more saline and sinks into the arctic basins, then what? Surely they [basins] must be overflowing somewhere. As an uninformed lurker myself, this is an interesting question. The cracks (seeming to originate near the coasts) have been occurring over the past month, since Feb10. It would seem to be not that difficult to determine if a correlation exists between the moon's location and tidal impact with the crack formation. I think only one of resident experts could look at this. It is certainly beyond me. Don't know if the basin is filling (I would think not) but is that needed for the Atlantic water that sinks into the Arctic Basin to impact melt? 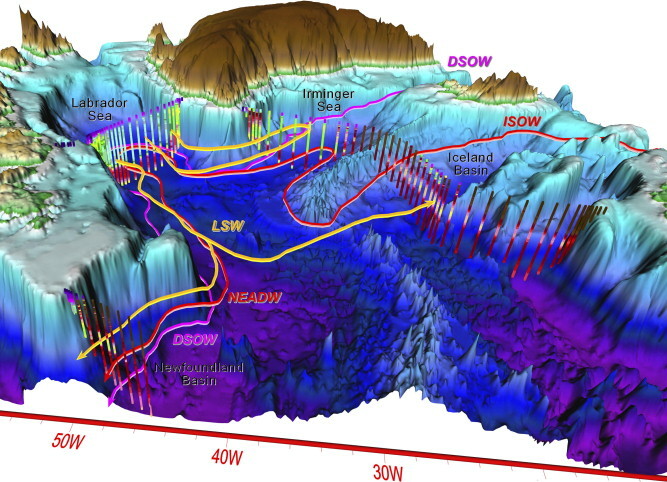 Could the ridges, especially the Lomonosov Ridge cause this warm salty water to upswell and cause melt under the icecap? I have been unintelligently luking here for about a year. There is a thin ice feature in the CAB (I think it is called the Laptev bite) which seems to parallel this ridge. Could this ridge be forcing the warm salty water up and be the engine behind the Laptev bite? Again a question for the better informed. Neven, would it be possible for some of the resident experts to visit here and scan our stupid questions? All of these "fresh eyes" may stumble onto something (besides our tongues) that is worth a more thorough discussion on an expert thread. Thanks for the map, I always wondered where Avannaarsua, Groenlandia was. thanks ivica, that's about the best map of Arctic I've seen in the net. then if someone would set the names of the major Greenland glaciers on it, it would make an excellent map. this site but it includes every small glacier too, being too detailed outside scientists i guess. I've been checking glacier names from wikipedia list http://en.wikipedia.org/wiki /List_of_glaciers_in_Greenland but it's typically for wikipedia arranged to an alphabetical order. a map might help to remember if Zachariae is north of 79deg-glacier or not, for examnple. My stupid question - what is the "goats head"? In another thread someone asked if the goats head was going to go into the Fram Straight this year. My guess is that it's a persistent multi-year ice formation - is that correct? Second stupid question, what are the ramifications of the goats head going into the Fram Straight? attached is large Map (2800 x 4858) of Greenland, 2.3 MB. Unfortunately I do not recall source. I'm another novice but can confirm your guess is correct. Generally, if ice exits via the Fram, it is transported out of the Arctic and melts away. 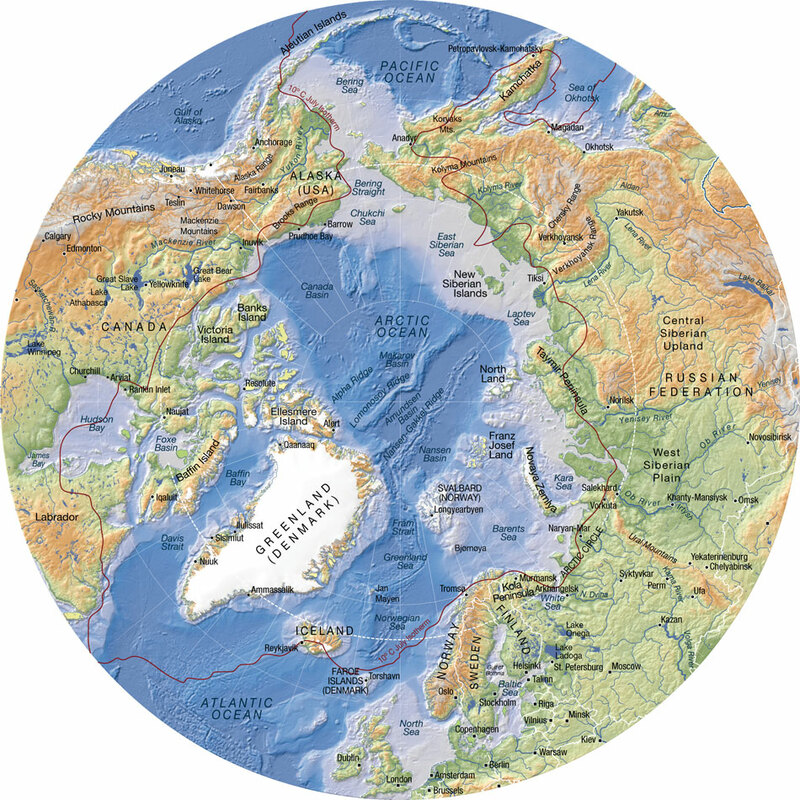 Arctic.io has a number of Arctic maps that many may find helpful and the NSIDC Atlas of the Cryosphere with it's overlays is a great resource. The USGS Satellite Images Atlas of Greenland has maps and images. Donna.....Goat's head is a floe of MYI that has been hanging out in the CAB for several years??? Someone posted an animation of the ice moving and it looked like this MYI was moving quickly towards Fram. "Looking at 1) Current Baffin/Newfoundland Sea Ice Area, 2) Sea Surface Temperature anomaly in the North-West Atlantic, 3) the Surface Air temperature Anomaly West of (and over) Greenland, and 4) the AO, I'd like to re-ask a question I asked last fall. What happens if the Gulf Stream decides to flow to the West of Greenland?" "What happens if the Gulf Stream decides to flow to the West of Greenland?" I'm not too sure it can do that since the East Greenland current is likely to stay the coldest current out of the arctic no matter what running in the the deepest channel = Fram Strait. but maybe it could be split in two (partly connecting to west Greenland current) somewhere south of Greenland southern cape. Only if there was a permanent high pressure area between Europe and Greenland it might completely change course. This has happened for a short while during 2009-2010 winter. so I'm not ruling out the complete diversion of the gulf stream totally. Certainly, there is the North Atlantic drift. Let's just take the North Wall, and maybe not even all of it. Seems to me the High is over Greenland, not east of it -- but what I'm looking at over the last few years that matters is the general northward shift in the Western Boundary Currents. What happens if a significant fraction of tropical Atlantic water flows to the west of Greenland rather than East of it? Arguing over whether such a change is a cause or an effect is separate, as is arguing whether it is actually happening or not. Your intuition serves you well! What you are describing there is deep water formation, which takes water on a thermohaline odyssey that ultimately leads to the north pacific some hundreds of years later. What happens if the Gulf Stream decides to flow to the West of Greenland? Basically, it can't. The water at low latitudes has a significant rotational velocity(at the equator 1000mph) This translates into momentum to the east as it travels north where the rotational velocity is lower(0.0mph at the pole). This momentum caries it south of Greenland and into the Barents. There is no way it makes that left turn, without an incredible force being applied to it continuously.Some does flow into the Fram, That is because sea level is low there, due to the strong deep outflow(Venture's effect). The warm water that blog is showing west of Greenland came from Labrador continental shelf (where they had a +5C anomaly this year). Are you confusing the Gulf Stream and the North Atlantic Drift? It is quite common to conflate the two currents, but there is a big difference between them. Last I read, they still didn't know why the Gulf Stream detaches from North America at North Carolina. I might also add that the Gulf Stream, at least in part, did in fact flow to the west of Greenland briefly in the Winter of 2010. The world's largest ocean gyres Western boundary currents are warm, deep, narrow, and fast flowing currents that form on the west side of ocean basins due to western intensification. They carry warm water from the tropics poleward. Examples include the Gulf Stream, the Agulhas Current, and the Kuroshio. Are you confusing the Gulf Stream and the North Atlantic Drift? It is quite common to conflate the two currents, but there is a big difference between them. No, I am not confusing them but you are. You see the "North Atlantic Drift" is the northern part of the Gulf Stream. To talk about the Gulf Stream re. Greenland is to include the North Atlantic drift as subset of the Gulf Stream. Are you confusing yourself with your right leg? Last I read, they still didn't know why the Gulf Stream detaches from North America at North Carolina. The Gulf Stream detaches from North America at North Carolina simply because it does not change direction for no good reason(conservation of momentum). This has been understood since 1687. No, that would have been the Irminger current. First described in 1854. Carl Wunsch is correct, reduction of overturning circulation will not impact ocean heat transport to Europe. Nothing short of the globe stopping turning would do that. Here is another stupid question: Does all the cold air moving into the mid-latitudes from the Arctic this year mean that warmer air has moved in to replace it in the Arctic, increasing temperatures and melting there? Not a stupid question. The answer is generally yes. We get those arctic blasts in the mid-latitudes when the arctic "loses containment" often due to meanders in the polar jet stream. This typically does mean that mid-latitude air is drawn north behind the arctic outbreak. Unfortunately, those plots are sold to shipping companies and it is hard to get current maps of the Gulf Stream. Given the title of this post and recognizing I am a source of stupid questions, I think this topic is intended to allow those of us who know very little (I am certainly one of them.) to ask questions that may not make sense. I hope it will encourage new visitors to begin to develop some understanding. As such, it would help if responses to people who post here are not dismissive and derogatory. The effect will to discourage new people from visiting and asking questions. My stupid question is when was the last time the arctic was ice free? I've posted claims from articles and refuted someone claiming the arctic was ice free during the Holocene Climatic Optimum by posting a study of sediment cores proving the area north of Greenland wasn't ice free then, but I've never seen a real scientific study showing the past conditions of sea ice in the arctic. If my memory serves me well, I believe that it must've been in the previous interglacial, more than 100K-120K years ago, that the Arctic Ocean could've been ice-free, if it wasn't somewhere during the Holocene Climatic Optimum. Yeah, there's some evidence of wave action in northern Greenland 8000 years ago that would imply significant periods where that coast was ice free, but it's far from a sure thing. The previous interglacial is known to have been warm enough. I have a lot of stupid stupid questions. So here goes! May be somewhat or probably related to the discussion on currents? What's the result of the saline-rich dense water that's being produced by more first year ice and more melting? Is there basically more energy in the system? Does that mean an increase in circulation? Is this going to send more ice out of the Fram? Is more relatively warm water going to be drawn northward into the arctic ocean or is the increase in circulation contained within the Arctic basins etc? Is the dense saline water relatively warm and causing a thermal-inversion layer (warm under cold)? And finally, if yes to critical aspects above is this another positive feedback? My stupid question relates to freshwater run-off from Greenland. The behaviour of low density meltwater is being put forward as a possible explanation for increasing winter ice in Antarctica. Might we see a similar effect in the Arctic, even to the south of Greenland, where meltwater is coming off land rather than from underneath an ice shelf? This effect may help thicken the ice to the north of Greenland in the past. But this ice has been mobilized by the cracking and probably will end up in the Greenland Sea, where it will get transported south and melt. Baffin Bay is seasonal ice so there can be no net accumulation. The main melting is in Aug-Sept, The freeze up in Baffin is in November, so the Labradore Current will have taken the fresh water away from the West side. The negative anomaly suggests that this mechanism is not playing a major role. Here’s one I haven’t seen mentioned: On a sunny, sub-freezing day, how much sea ice (or ice-sheet ice) can be lost through sublimation (ice changing directly to water vapor)? Very possibly a stupid answer. It will depend on wind speed, atmospheric dry bulb/wet bulb ratio and actual temperature, probably in that order. It takes a lot of energy to sublimate ice - add both phase changes together 334 J/g + 2260 J/g = 2594 J/g - so a strong dry warm breeze would help. You could melt about 7.75 kilos of ice or sublimate 1 kilo with about the same amount of energy. Never thought of that one Sigmetnow, good question. I do notice that a surprising amount of ice sublimes from the roads during the cold sunny days of winter, even when it's 0F. With the roads it's a little different though, because the ice is on top of a black asphalt road that readily warms in the sun. Right. I kept looking at the Sea Surface Temps and the Air Surface Temps and thinking, “As long as those are cold, the ice is pretty safe.” But with sublimation, I guess it’s only about 1 / 7.75 -- or 87% -- safe. Isn’t there a trend towards more high-pressure areas (“anti-cyclones”) over the arctic ice these days? That would mean more sunshine, as well. The measure of this is called the AO(arctic oscillation). A strong negative AO=arctic anti-cyclone. Is the AO going to go even more negative than March, or is Spring going to set in first? Greenland marine-terminating glacier area changes: 2000–2010 has glaciers location map on the page 92.